Home Inspector: Is metal roofing worth the extra cost? 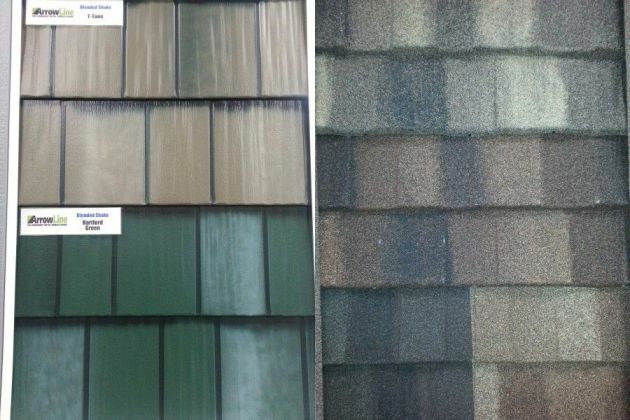 Asphalt roofing shingles dominate our market. Simply drive through almost any neighborhood in the Twin Cities area and you will find overwhelming evidence to back this up. You may see some cedar shakes here and there, or maybe the occasional clay roman tile roof on a stucco house around Lake Calhoun or Lake Minnetonka. Yet another kind of roof has been slowly gaining steam over the past several years- metal. The main reason for the "slowly" is because of the extra expense to the homeowner. Regardless, there are some clear advantages to metal roofing for those who are willing to pony up the dough. In this post, we'll discuss the advantages and try to evaluate if they justify the price increase from asphalt. Before we get into the differences, there are several different metal roofing options. Standing Seam- This is typically the first type of roofing people think about when the hear "metal roof." This is the vertical option that you would see on everything from a McDonald's to a chicken coop. However, they vary greatly in quality depending on whether it is the roof over McNugget consumers or the roof over future McNuggets. The higher quality you would see on a house or commercial building is typically the "hidden fastener" option with a thicker gauge metal. Some people really like the completely different look it gives the home, and they are popular for lake cabins as well. Green standing seam roofing on a log cabin is something you will see repeatedly while driving around the Brainerd area lakes and resorts. Many standing standing seam roofs require "avalanche blocks" (see picture of green roof above). When enough snow builds up on a standing seam roof, it can all give way at one time and come flying off the roof like a freight train. The blocks are installed at the bottom portion of the roof above walking surfaces, and it prevents homeowners or customers from becoming human snowmen (or women). It will also prevent large sheets of ice from sliding down and hurting people. Metal Shakes or Slate- Metal roofing can also come in a "shake" or "slate" look. Right here in Hopkins, EDCO products manufactures several of those. With solid color and blended colors, there are lots of options for the more traditional look in a metal product. You will still need avalanche blocks for certain areas and pitches (see picture in EDCO photo gallery) since this is a smooth metal product. Stone-Coated Metal- There are some products that have an asphalt appearance but are actually metal. Stone-Coated products like Metro Roofing have the advantages of metal without the need for avalanche blocks. Since it has stone granules, the snow will melt more like an asphalt roof. Metro has shingle, shake, and Roman tile options. How Long Do They Last? If you can get 20 years out of an asphalt roof, you're doing pretty good. The average homeowner spends about 13 years at a house, so getting a 50 year warranty from a metal roof is not typically the deciding factor in the purchase. Not to mention most asphalt shingles have "lifetime" warranties nowadays. Why would asphalt shingle companies give "lifetime" warranties on a product that won't last a "lifetime?" See previous comment about average homeowner spending 13 years in a house. These warranties do not transfer to multiple homeowners after the original person who bought it. Metal roofing definitely has better longevity than asphalt, but are people willing to spend double just for that? It depends on how long you plan living there, and having it as a selling point to the next homeowner may come into play. No More Dammed Ice! We've had some mild winters and some that were just plain cruel in the past several years. When your house has a load of snow sitting over an attic that is not properly vented, air sealed, and/or insulated, guess what happens? Ice dams! The melting caused by heat escaping your house and warming the bottom of your roof deck starts a cycle of freeze, thaw, ice reaching heated wall, melting, water leaking in the house, huge icicles outside, etc... read Reuben's article about ice dams. While proper attic air sealing, venting, and insulation can help this situation quite a bit, some homes still allow the warm air through to the roof deck. Other houses have "hot roofs," or roofs that don't have an attic below it at all. This could be an old attic that was remodeled into finished space and now has a vaulted roof. These can have ice dams too. 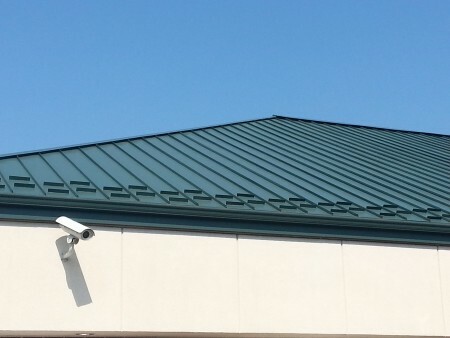 With metal roofing, it is very common to go over the existing roof without tearing it off. There will typically be an air pocket between the old roof and the new roof. If the metal product is flat with less of a profile (like the Metro shingle-style), I recommend installing on top of vertical wood batten strips so the air gap will be there. A venting strip is installed at the bottom and there will be vents at the top, so the cold air can travel through and keep the roof cold throughout the winter. A cold roof means no ice dams. In theory, there could be some energy savings because of the previously mentioned air gap between the old roof and the new metal one. In the summer, this really helps. Roofs absorb the sun's heat and can start to fight against your air conditioner, especially in a house with poor attic insulation/ventilation. Asphalt roofing sits right on your roof deck; heat conducts through, which then radiates to the rest of the attic. With an air gap above your existing roof for cooler air to enter and warmer air to escape (in theory), less heat makes it through to your home. Going with lighter colors will also help reflect more heat. There are more things to take into account than just, "Which one holds up better to hail?" Your answer to this question is to find the products that are Class 4 hail-rated, which many of the metal options are. Roofing materials are rated from Class 1 to Class 4 (4 being the most resistant to hail). Standard architectural asphalt shingles are not Class 4 hail-rated, but you can upgrade to an asphalt option that is. Many insurance companies will reduce your premium if you have a Class 4 hail-rated roof. The deduction amount varies based on the type of roofing that is on your roof previous to making the change. It also depends on your insurance company and wording of the policy. Talk to your agent to find out how much you would save by having a Class 4 roof. This would be another potential argument to use the stronger metal roofing (or upgraded asphalt). However, some use the hail argument as a reason to install asphalt. A customer once said to me, "Asphalt is much less expensive and it should last me 20 years, right?" I nodded. He then asked, "In twenty years, chances are I get a new roof through insurance from hail hitting my house, right?" Maybe. Of course, there is no guarantee of the big hail storm. There is also the chance that you get hit by hail three times and have to go through the process of re-roofing, paying your deductible each time, and having insurance companies drastically change their hail policy if there are too many hail events. If you're a gambling individual, you may want to take some of these factors into account. I'm a fan of Class 4 hail-rated materials, whether it is metal or asphalt. Metal Disadvantages Disadvantage #1 with a bullet is cost. You could pay 2-3 times more depending on which type of metal roof you are looking at. It is also a lot easier to walk on an asphalt roof than a metal roof. If you have smooth metal and a steep pitch, you may as well spread several sheets of bubble wrap all around your house before you head up that ladder. Your trip down will be a lot quicker than your trip up. The stone-coated metal products are much more walkable than the smooth. So, is metal roofing worth the extra charge? If you are planning to be in your home for quite a while and you don't want to go through the hassle of replacing it in the future (or if you have major ice dam issues), absolutely. You could pay for a metal roof once or you might end up paying for an asphalt roof twice. Paying for the metal roof once and having the advantages is a good way to go. While looking at long term effects, it can certainly make sense. But how many of us look that long term? The reason asphalt still rules the industry is the affordability. If homeowners have to choose between a metal roof or an asphalt roof along with a family trip to Hawaii, many people will say "aloha" to metal roofing and "aloha" to asphalt roofing. Since "aloha" means both hello and goodbye, I'll let you decide which is which in the previous sentence.